As of March 2014, 46,097,719 Americans in 22,476,109 households receive SNAP EBT benefits (Food Stamps). A partir de marzo de 2014, 46,097,719 de estadounidenses en 22,476,109 hogares reciben los Cupones para Alimentos EBT (SNAP). 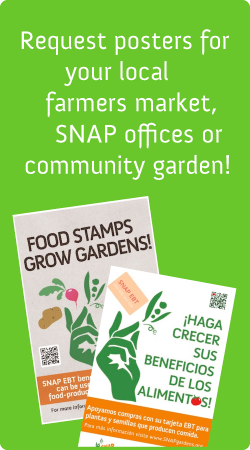 Households can use SNAP EBT benefits (Food Stamps) to buy seeds and plants which produce food for the household to eat. Se puede usar los Cupones para Alimentos EBT (SNAP) para comprar plantas o semillas para cultivar comestibles.